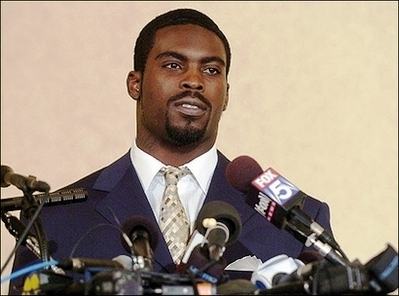 I don’t really know how I feel about Michael Vick being allowed back into the NFL and signed to a team. On the one hand he’s done the time for his crime, but on the other hand the activities he was involved with which landed him behind bars were brutal and violent, and not at all the role model behavior an NFL football player should demonstrate. While taking responsibility for his actions is a good thing for his young fans to see, I’m not sure if it’s enough to erase the whole Michael Vick dog fighting thing. After much speculation and rumors of various teams, Michael Vick has officially signed with the Philadelphia Eagles – although he’ll have to wait a while before he actually gets to hit the field. Vick will have to pass a physical, and per the current terms of his NFL suspension he will be allowed to practice with the Philly Eagles, but is not eligible to play until their third preseason game. Michael Vick and the Philadelphia Eagles agreed to a one-year deal for $1.6 million with a team option for 2010 at $5.2 million. A source close to the quarterback says Vick chose the Eagles football team over one other top team. Before the news of Michael Vick’s signing with the Eagles was confirmed by his agent Joel Segal, it was reported by Dan Sileo of WDAE in Tampa on Thursday evening; followed a half hour later by Chris Mortensen’s announcement during the Cardinals vs. Steelers game on ESPN. Only time will tell if Michel Vick is truly reformed and no longer a part of the dog fighting scene. I wish him the best of luck. 51 queries in 2.531 seconds.